POMPANO BEACH, FL – October 7, 2015- Onstream Media Corporation (OTCQB: ONSM) a leading online service provider of corporate audio and web communications, including webcasting, webinar, conferencing and virtual event technology, has reported its financial results for the first quarter of fiscal 2015, the three months ended December 31, 2014. 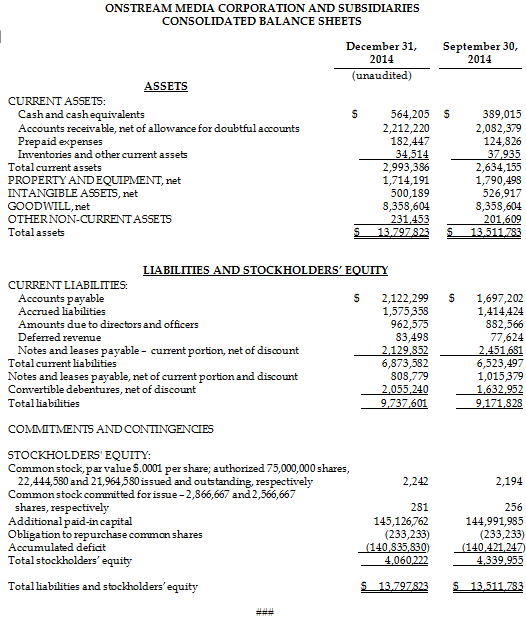 Consolidated revenues were approximately $4.2 million for the three months ended December 31, 2014. There was no material change in consolidated revenues for the three months ended December 31, 2014, as compared to the first quarter of fiscal 2014. Digital Media Services Group revenues were approximately $1.5 million for the three months ended December 31, 2014, an increase of approximately $21,000 (1.5%) from the first quarter of fiscal 2014. Audio and Web Conferencing Services Group revenues were approximately $2.8 million for the three months ended December 31, 2014, a decrease of approximately $26,000 (0.9%) from the first quarter of fiscal 2014. Consolidated gross margin percentage was 73.6% for the three months ended December 31, 2014, versus 71.7% for the first quarter of fiscal 2014. EBITDA, as adjusted, for the three months ended December 31, 2014 was approximately $351,000, an increase of approximately $93,000 (35.8%) as compared to EBITDA, as adjusted, of approximately $258,000 for the first quarter of fiscal 2014. The $21,000 increase in Digital Media Services Group revenues for the three months ended December 31, 2014, as compared to the first quarter of fiscal 2014, was primarily due to an increase in webcasting division revenues. Revenues of the webcasting division decreased by approximately $64,000 (5.5%) for the three months ended December 31, 2014 as compared to the first quarter of fiscal 2014. The approximately 1,100 webcasts we produced during the three months ended December 31, 2014 was approximately the same as the number of webcasts we produced during the first quarter of fiscal 2014. The average revenue per webcast event of $1,177 for the three months ended December 31, 2014 was also approximately the same as for the first quarter of fiscal 2014. 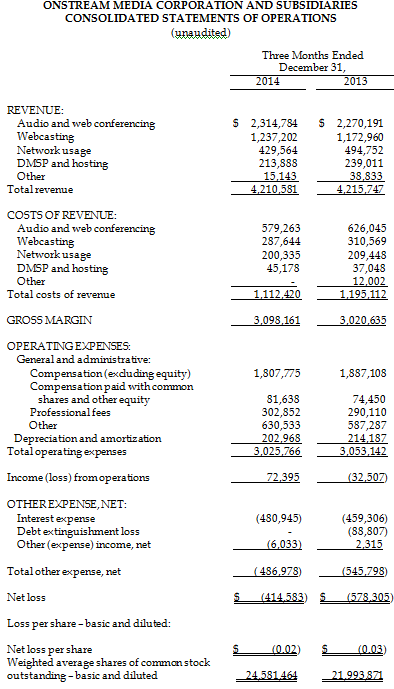 The $26,000 decrease in Audio and Web Conferencing Services Group revenues for the three months ended December 31, 2014, as compared to the first quarter of fiscal 2014, was primarily due to a decrease in the EDNet division’s network usage revenues and in particular lower usage of EDNet’s bridging services. The Infinite and OCC divisions, which are also part of the Audio and Web Conferencing Services Group, had combined revenues of approximately $2.3 million for the three months ended December 31, 2014, which represented an increase of approximately $45,000 (2.0%) as compared to the first quarter of fiscal 2014. This was in turn primarily due to a 17.9% increase in the number of minutes billed by the Infinite division which was approximately 38.7 million for the three months ended December 31, 2014, as compared to approximately 33.3 million minutes for the first quarter of fiscal 2014. This increase in the number of minutes billed by the Infinite division was partially offset by a decrease in average revenue per minute, which was approximately 5.6 cents for the three months ended December 31, 2014, as compared to approximately 6.2 cents for the first quarter of fiscal 2014. Consolidated gross margin was approximately $3.1 million for the three months ended December 31, 2014, an increase of approximately $78,000 (2.6%) from the first quarter of fiscal 2014. Our consolidated gross margin percentage was 73.6% for the three months ended December 31, 2014, versus 71.7% for the first quarter of fiscal 2014. This increase in percentage was primarily due to a reduction in audio and web conferencing cost of sales, in absolute dollars, even though audio and web conferencing revenues increased. Effective June 2014, we renegotiated a supplier contract representing approximately $295,000 in annualized savings, which reduced our cost of sales by approximately $70,000 in aggregate for the first three months of fiscal 2015, as compared to the corresponding prior year period, and we expect will reduce our cost of sales by approximately $127,000 in aggregate for the next five months of fiscal 2015 as compared to the corresponding prior year period. Effective June 2015, we again renegotiated the same supplier contract representing approximately $219,000 in annualized savings, which we expect will reduce our cost of sales by approximately $73,000 in aggregate for the last four months of fiscal 2015 as compared to the corresponding prior year period. Consolidated operating expenses were approximately $3.0 million for the three months ended December 31, 2014, a decrease of approximately $27,000 (0.9%) from the first quarter of fiscal 2014, due to an approximately $72,000, or 3.7%, decrease in compensation, including compensation paid with equity, as compared to the first quarter of fiscal 2014. During the period from June 2013 primarily through February 2014 we made certain headcount reductions representing approximately $1.1 million in annualized savings, which accounted for an approximately $145,000 reduction in cash compensation expense for the three months ended December 31, 2014, as compared to the first quarter of fiscal 2014. This reduction was partially offset by increased compensation for the remaining employees, increases in health insurance and other benefit costs and a reduction of capitalized payroll related to software development. Onstream’s first quarter fiscal 2015 net loss of approximately $415,000, or $(0.02) loss per share, was based on approximately 24.6 million weighted average shares outstanding, as compared to a first quarter fiscal 2014 net loss of approximately $578,000, or $(0.03) loss per share, which was based on approximately 22.0 million weighted average shares outstanding. The decreased net loss was primarily due to the increase in gross margin discussed above. In addition, there was an approximately $59,000, or 10.8%, decrease in other non-operating expenses for the three months ended December 31, 2014, as compared to the first quarter of fiscal 2014, which decrease was primarily due to a debt extinguishment loss of approximately $89,000 recognized during the first quarter of fiscal 2014, for which there was no corresponding item during the three months ended December 31, 2014. Cash provided by operating activities (before changes in current assets and liabilities other than cash) for the three months ended December 31, 2014 was approximately $151,000, compared to approximately $71,000 provided by operations for the first quarter of fiscal 2014. This approximately $80,000 increase was primarily due to the increase in gross margin discussed above. 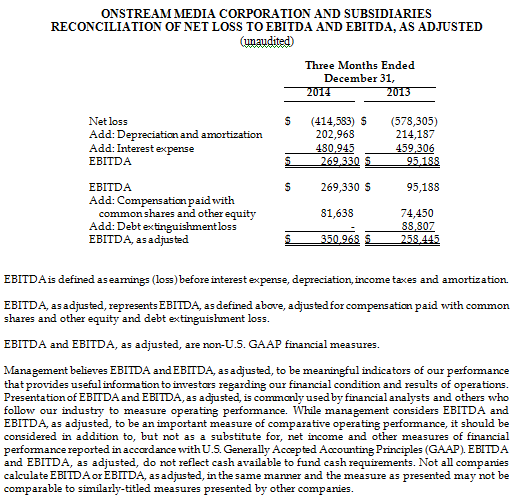 Because of the timing of the release of these results and the filing of the related 10-Q, Onstream’s leadership team will combine its conference call discussing the financial results for the three months ended December 31, 2014 with a discussion of the financial results for the second and third quarters of fiscal 2015, the three month periods ended March 31 and June 30, 2015.The time and date of that combined conference call will be announced by us when the third quarter fiscal 2015 10-Q is filed.